When I daydream about catching bass, my initial vision is of mist rising off a lake’s dead-calm surface, followed by the most primeval eruption as a big ol’ bucketmouth viciously attacks my topwater lure. And I’m guessing it’s a very similar image for most anyone that loves catching largemouth bass. Without a doubt, the feeling of your heart skipping a beat results from an instant infusion of adrenalin, induced by the sudden surface assault. And while that feeling of exhilaration is the very reason so many anglers love catching bass that way, there is also a major problem when it happens… the impulsive quick hookset comes so naturally that we end up pulling the lure away from the fish’s face before it’s gobbled it up. It’s happened to all of us. But it doesn’t have to be as common of an occurrence. Three primary factors influence your topwater success once a fish has committed: your chosen line, hooksetting technique, and rod in your hand. Seaguar bass pro Cliff Crochet is known for his topwater proficiency. 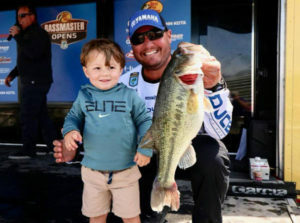 The Pierre Part, Louisiana, resident has been fishing the Bassmaster Elites and Opens for 9-plus years, with 104 tournaments under his belt. He’s won one, and has numerous top-10 and -20 finishes, earning him near a half-million in winnings. And he knows all too well the frustration of being too hurried to set the hook when a fish blows up on his bait. Generally, Crochet uses all three line types for topwater – braid, fluorocarbon and monofilament. And which line he chooses isn’t just dependent on the lure he’s using, but the situation in which that lure is being presented. Crochet’s go-to monofilament is Seaguar Rippin’ Premium Monofilament, with 20-pound test his first choice for waking, popping and chugging baits. Running mere inches below the surface, some consider wake baits, ChatterBaits and gurgling spinnerbaits the descendants of topwater baits. Regardless, they, too, require specialized gear and techniques. Crochet’s choice when going subsurface is a 7-to-1 reel spooled again with 20-pound Rippin’ Monofilament for open water or short weeds, but to the same pound test in Seaguar InvizX fluorocarbon when fishing over thicker grass, stumps and rocks. The near-neutral buoyancy and low stretch of fluorocarbon allows you to swim your baits at the precise depth below the surface. Crochet says two inches off where you want your bait running is huge, and fluorocarbon can assist in precise bait placement. One of the biggest mistakes many anglers make when it comes to topwater fishing is thinking it’s a warm-water, early-morning or late-evening-only bite. Crochet says no matter where you’re fishing, once the water reaches the mid-50’s bass will start looking to the surface for forage. You just may want to stick with lures that can be fished at a slower pace. And it’s during the spring period when the middle of the day can be the best surface bite as the water will be at its warmest. Lures that are fished at a fast pace, however, such as buzzbaits, will get bit more once the water temperatures tickle the mid-60’s and above. Lastly, Crochet says to let your fishing situation dictate what line to use. Monofilament in areas where you don’t have to worry about losing fish around structure; braid where getting fish up and out is necessary (just remember to pivot, lean back and keep reeling as a hook set); fluorocarbon for subsurface when a little extra “oomph” is needed, or, when the fish are being picky about how far under surface they want you lure to be presented. This entry was posted in Bass Fishing, How To Fish on June 2, 2018 by ronniegarrison. 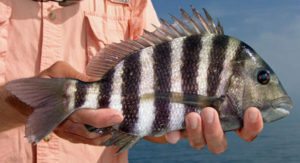 Abundant and aggressive, the sheepshead is one of the sea’s tastiest fish. Bucktooth bandits with a frustrating habit of stealing ill-presented baits. That’s one way to describe sheepshead; but you might also call them sporty, abundant and oh, so tasty. This entry was posted in How To Fish, Saltwater Fishing on May 29, 2018 by ronniegarrison. In Florida, trolling is one of the standard bluewater techniques for offshore fishing. Many northern anglers also employ trolling in lakes routinely. So why isn’t this method of fishing more popular in Florida’s fresh waters? First, it’s an illegal method for tournaments—which should tell you something about how effective trolling can be! Also, our fresh waters simply aren’t deep enough for trolling techniques like downriggers or diving planes. Finally, the abundant vegetation in Florida lakes and ponds can interfere with traditional trolling methods. However, under the right conditions and with proper selection of lure or bait, trolling can be practical here. Whether you’re on a first visit to a new lake or returning to your favorite pond for the hundredth time, trolling is an effective way to find and catch fish. Trolling motors — They’re actually called “trolling” motors, so why not use them as such? The heart of a trolling system is indeed going to be the motor. Anglers today enjoy a broad selection of electric motors that are more convenient and more powerful than their predecessors, with a number of available options to make trolling that much simpler. Make sure that you choose a motor adequate to the size and weight of the boat; a careful choice will allow you to maintain a steady troll in the face of diverting winds or currents. Both bow and transom mount styles are available. A trolling motor will last for years if properly cared for. Remove the prop and check for fishing line after each trip; if line works past the seals into the electric motor itself it can ruin it. When the prop is removed, hit any exposed lower unit bolts with a shot of WD-40 to prevent corrosion during storage. When on the water, remember to raise the trolling motor before jetting off to the next spot, because the forced turning of the prop can burn out the electric motor. Trolling gear — Most spinning or casting outfits are suitable for trolling (even flyfishing gear). For most trolling, anglers will want to keep their hands on the rod rather than place it in a rod holder. Longer rods have the advantage for more precisely controlling the path of bait or lure as you troll past an enticing looking stump or patch of lily pads. They also provide for more distance between baits when running two lines off one boat. If you’re a light tackle angler you might wish to switch up a couple pounds in line test, as the forward momentum of the boat coupled with a fish’s strike may lead to more breakoffs than you are accustomed to. A depth finder is a tremendous aid in trolling. It will help you monitor the bottom to ensure that you are maintaining the ideal depth for your lure of choice. It will also reveal bottom structure (and even fish) so that you can prepare for a couple of bumps (or a strike) on the line. Depending on the lure or bait, it will also give you enough warning to lift your rod tip and raise your bait clear of an obstruction. Some trolling motors even come with depth finders built in. A speedometer can also be very helpful to track your actual trolling speed (relative to the water itself) when wind and current are either speeding or slowing your boat. It also allows you to maintain the best speed for a given lure (which of course you tested beside the boat before beginning your troll). Batteries — A few thoughts on batteries are in order . . . first of all, you should have a dedicated trolling motor battery. Hooking those alligator clips up to your starting battery might leave you furiously hand-cranking that 90 HP outboard as the sun sets with you still ten miles from the ramp. Only buy a deep cycle battery engineered to handle a steady drain (the reason starting batteries don’t perform well for trolling is because they are designed to provide only short bursts of power). Modern technology has created a number of advancements in the type and efficiency of trolling batteries, but pay attention to the manufacturer’s instructions for charging and depleting your battery in order to maximize its longevity. Trolling for bass — Bass are one of the easiest Florida fish to troll for. There are already a variety of weedless lures available, which help offset one of the primary hurdles to trolling in Florida’s fresh waters. A Carolina-rigged plastic worm is possibly the most weedless trolling lure there is, able to bump and slither its way over and around a broad array of obstacles. When trolling with plastic worms, run dead slow with frequent stops. Hold the rod tip forward of your sitting position; when the familiar tap-tap-tap of a strike occurs, you can instantly drop the rod tip back and give the fish some slack as you stop the motor and prepare to set the hook. Other weedless bass lures to try include spinnerbaits, Johnson Silver Minnows, curly-tail grubs, and weedless spinners like a Snagless Sally (be sure to use ball bearing swivels with the latter). In more open waters, a shallow-running Rapala or Rebel minnow is hard to beat (though you can use any of the lures listed above); Rat-L-Traps are another great choice. 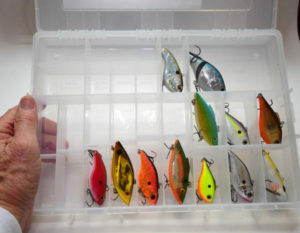 Speed-trolling these lures as fast as they will go without rolling will sometimes produce fish when other tactics fail. For deeper locales, use crankbaits to get down to the fish. Choose crankbaits based on the desired depth, but keep in mind that a trolled lure will run deeper than its rated running depth (which is usually based on cast-and-retrieve). For any lure except plastic worms, keep your rod tip back instead of forward and set the hook instantly when you feel a strike. Trolling with bait can be very effective. Shiners and shad are the temptations of choice. Always hook the bait through the lips. Troll slowly enough so that the minnow can swim naturally and isn’t being dragged through the water. If a bait begins to roll on the surface, you’re going too fast. In weedier waters, use a hook with a weedguard. If you need to get your bait deeper, add split shot a foot or two up the line; if the bait keeps diving into vegetation, a tiny streamlined float will keep it near the surface. As with worm trolling, keep your rod tip forward so that you can yield some slack and allow the fish to take the bait before you set the hook. Trolling for sunfish — Most of what was said about bass trolling applies equally to bream, but on a smaller scale. (You might pick up an occasional crappie too, but they are usually too deep and too closely associated with cover to troll for easily.) Fewer appropriately-sized weedless lures are available. However, Beetle Spins are excellent and weedless curlytail grubs in the smaller sizes also do well. For hard baits, the selection is also more limited. Tiny crankbaits draw strikes, as do small spoons and spinners. However, trolling speeds need to be slower and you must pay more attention to make sure the lures are not rolling. One trick with spinners is to tie a foot or two of line to the treble hook and then put a small nymph or wet fly on the end; fish leery of the spinner will often pick up the fly. You must use a swivel if trolling a spinner, and will probably have to untwist your line periodically by cutting off the lure and letting the line trail freely behind the boat for a few minutes. This entry was posted in How To Fish on February 10, 2018 by ronniegarrison. 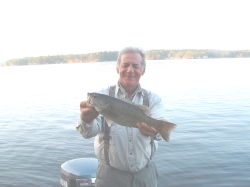 Stirring bass out of their lethargy when water temperature is in the low 40’s, as it is now across much of open-water territory in the south and west, can be a challenge, no doubt about it. But making use of the fast-sinking lures known as lipless crankbaits or sometimes as “rattle-baits” because all have some sort of metallic beads inside to produce noise is one proven tactic that consistently produces. The lures sink as fast as jigs or weighted plastic worms, but can be fished considerably faster, and the noise they generate seems to wake up the fish in a way that others do not in cold water. Among the many versions is the Cordell Spot, perhaps the original, and the Bill Lewis Rat-L-Trap, now the most widely-known and used. Other good ones include the Strike King Redeye Shad, Rapala Rippin Rap, Yo-Zuri Vibe, X-Calibur Xr 50 and many more. The lures suitable for bass fishing weigh anywhere from 1/4 to 1 ounce, with the heavier ones usually preferred for winter fishing because they stay deeper when activated. The lipless lures go through the scattered grass left by winter’s cold easily in most cases despite their treble hooks. In fact, the favored fishing tactic at this time of year is to find scattered grass in 8 to 12 feet of water and fish the lures with a sort of lift-and-drop retrieve that is somewhat similar to fishing a jig. Experts in the tactic say it simulates a cold stunned shad trying to maintain equilibrium. When the bite comes, the hooks are set and it’s game on. To be sure, the lures frequently pick up dead grass, but this can often be felt as the action of the lure stops, and can sometimes be cleared by “ripping” the lure upward very hard for a pull or two before going back to the lift and drop retrieve. Best locations are often on the edge of submerged creek channels, where the dead grass stands on the shoulder of a deeper drop. Old road beds with ditches a few feet deeper than the roadway can also hold fish, as do shell bars off the larger channels. Use of a big-screen sonar and GPS mapping system makes it easy to scout out likely areas. Creek channels coming out of shallow flats that are spawning areas in late March and April can be particularly productive. As in all bass fishing, it’s a matter of doing a lot of scouting before the serious casting begins. Most anglers fish the lures on 12- to 15-pound test fluorocarbon, which gives a better feel for the lure than more stretchy monofilament. Some of the lures give better action if an added snap swivel is added above the split ring; otherwise, a turtle-style loop knot is best for allowing maximum movement. Most anglers use a medium action rod, relatively slow, so that the hooks are more likely to stay put–glass composite rods, rather than pure graphite, are favored by serious rattlebait fans. Favorite colors include silver, white and pearl, which imitate shad, as well as a brownish orange that some anglers believe looks somewhat like crawfish. Whatever the bass might think it is, the lipless crankbaits clearly look like food–they’re one of the best offers you can make until things start to warm a bit towards spring. This entry was posted in Bass Fishing, How To Fish on February 8, 2018 by ronniegarrison.